The newest a-england collection, Elizabeth and Mary, is here! I'm so sorry it's taken so long to show you. Swatching this group was derailed when my camera went sour. Fortunately, these polishes are still available at a-england.co.uk and stockists worldwide. I love Adina Bodana's creations. She always has such thoughtful inspirations for each release. This collection is inspired by "two iconic Queens in British history" and includes a shimmer, a metallic and three holos. Each is beautiful and has a-england's trademark buttery formula. 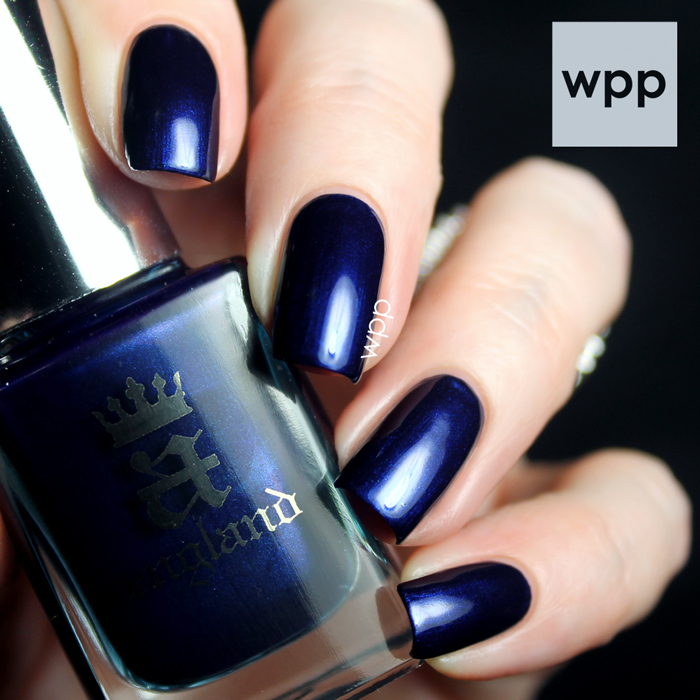 All swatches are two coats, finished with a-england The Shield topcoat. I'll start with my favorite. Crown of Thistles is an absolutely gorgeous purple with a super-fine, scattered holo effect. It's just so unbelievably pretty! Virgin Queen is hard to describe. It's a metallic holo with hints of antique and rose gold, champagne, bronze...it depends on the lighting. It's a dark neutral that's blingy, but still appropriate for work. I'll get lots of use for this one! Gloriana is a rich, rusty red with golden flecks/shimmer. It definitely leans more orange, than red. The formula was really smooth. This is two easy coats. 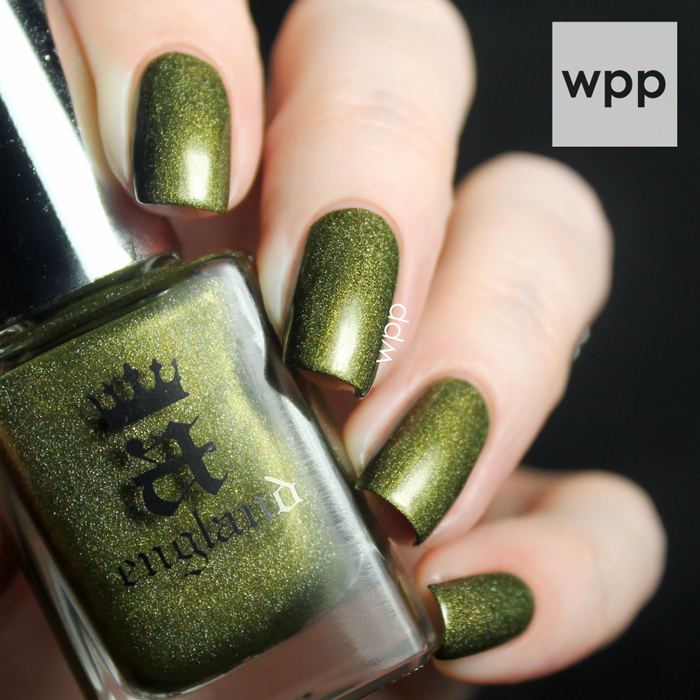 Fotheringhay Castle is a deep, olive green holo. I don't think olive shades are very flattering on me (although I'm kinda digging it in this pic), but it's a great polish. This one was also practically a one-coater. Queen of Scots is my second favorite. It's a crazy intense blue with shimmer. It is soooo pigmented...a one-coater if you're careful. I went with two thinner coats. It has so much dimension to it. I can't stop staring at it. I've never met an a-england I didn't like. What do you think? Which is your favorite? The a-england Elizabeth and Mary Collection is available now. Polishes are $10USD each. 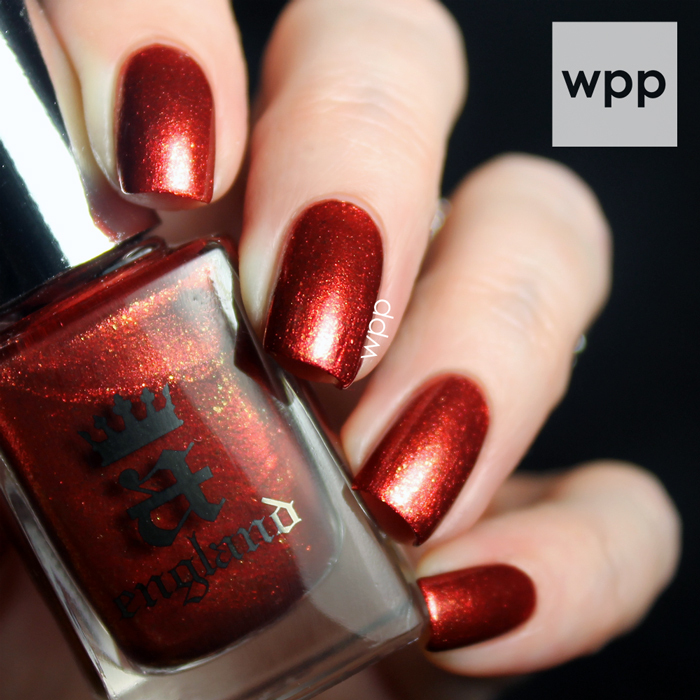 Visit the a-england website to shop if you’re in the UK or check out the Where to Buy page for stockists worldwide. (Most of the US indie sellers, such as Llarowe, carry the line.) Follow a-england on facebook, twitter and instagram for news and promotions.